I never thought I would struggle with my weight. As a kid, I was always skinny. When I started taking karate and horseback riding lessons in junior high, I built muscle and toned. In high school, my weight yo-yoed but never got above 135 pounds. My freshman year of college, I became a vegetarian and lost the "freshman 15" instead of gaining them. I spent my days in class and my evenings working out, riding horses, and taking ballet classes. Then life happened. I gave up being a vegetarian and worked out less. I got married. I sold my horse. I had kids. I gained weight. I lost weight. I went back to school and gained a lot of weight. Now, I find myself hovering (a second time) on the edge of my heaviest weight ever. And I don't like it. When it comes to my health, I'm not following those commands. Instead, I'm abusing my body. I fill it with unhealthy food. I overeat. I neglect my workouts. I have not glorified God with my physical health. And it's not okay. Today marks a fresh start for me. 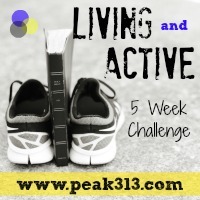 I'm starting the "Living and Active" challenge with Claire at Peak 313. For me, this challenge isn't about being supermodel skinny. It's not about getting six-pack abs or building big muscles. It's about giving God my best - spiritually, mentally, and physically. My faith is everything to me. It's not just part of me - its all that I am. I know that if I skip my morning time with God, or if I don't have Christian music playing during the day, or if I skip church and feeding my soul - I can't do all that He calls me to do. I can't be a good wife and mom, be my best at work, or lead children's ministry if I'm not spending time with God. I can't give to others unless I fill up first. Yet that's exactly what I've tried to do physically, and it's not working. I feel awful. So many days, instead of being at my best, I'm bloated, sluggish, and achy. I'm always exhausted. I'm stiff and sore in the mornings. I don't sleep well. I'll admit it - I don't want to live my life this way. I want something better. I'm ready for changes, and this is the perfect place to start. I love this challenge because it's doable. This isn't extreme - and I have been to both extremes. I have eaten until I gorged myself, day after day, hiding my feelings behinds food. I have gotten scary skinny, hovering on the brink of an eating disorder. Extremes don't work. They don't last. I'm ready for consistent, healthy changes. I'm ready for to be living and active.